Darn it though, the cover art and photo showed so much potential. 3. The production / songwriting team of Wes Farrell and Tony Romeo. Wes was both a songwriter and a producer giving the world such hits as "Boys" which appeared on the first Beatles record and "Hang on Sloopy" made famous by the McCoys. Wes was also them man behind all the Partridge Family music. He wrote the massive hit "I Think I Love You" as well as the iconic theme to the TV show, and produced most of if not all the Partridge Family recordings. I can't be 100% certain but I believe Tony was a co-writer and co-producer for some of the Partridge Family music as well. The problem here is Good and Plenty can't really sing which is a shame because you can hear the decent songwriting at work. There are terrific pop keyboard heavy songs dressed in horns and all sorts of other fun layers but the vocal performance kills anything happening behind the singing. Knowing this history of Wes Farrell I have decided this was his test run for the Partridge Family. Love or hate that swinging 70's family of singers, they were candy coated pop personified. The actors had the star power to make those songs work and well sadly Doug and Ginny, no matter how fantastic they look, don't have the musical talent to make these pop songs pop. Their voices (really Ginny is mostly to blame here) quiver, whistle and swerve as if the love generation was drunk driving through a world of rainbows and Doug sounds more asleep at the wheel than anything else. I have placed the one and only decent song "She Is the We of Me" here. The first song "Children Dreamin' " was the official single but there aren't enough seagull cries, ocean waves crashing, or chimes to make that song work for me. 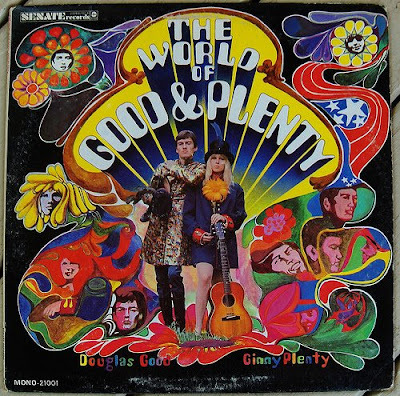 The World of Good and Plenty is a lovely piece of wax. Sunshine pop with a few forays into other genres like folk("Beautiful People"),Vaudeville(Ginny Plenty gets down and dirty on "The Guy Who Did Me In") and rollicking goodtime music("Ho Hum"), written by the late Tony Romeo and Wes Farrell, the songwriting team behind the Partridge Family. Romeo was also a member of the Trout, a group who recorded one quirky album for MGM (worth searching for), but his absolute zenith as a songwriter was Richard Harris' brilliant but sadly neglected concept album,Slides. As for The World of Good and Plenty, it's a period piece dripping with flower power, which can be charming if you were around in the late '60s. Nice write-up. You're right about this album, sad to say. It's a disappointment. I was expecting something along the lines of Jim & Jean or a long-lost precursor to Mazzy Star, Opal, or Beach House. But this just doesn't work for the reasons you mention...and more, which I don't think is worth taking the time to go into. One addition: there was another single pulled from the LP, "Living in a World of Make Believe," which was a very minor chart hit. It hit the Bubbling Under chart at #111, 12.23.67 and stayed on the chart for four weeks. The 45 was Senate 2015 and the b-side was "I Played My Part Well" which is on the album. Info from the Billboard "Bubbling Under" book -- and here is the 45cat listing: http://www.45cat.com/artist/good-and-plenty. My introduction was the 45 single, which came as part of a "Ten Hit Tunes You Missed!!" carton from JJ Newberry's for $1.10. "Current" 45s were 77 cents at the time, so I figured I only needed to like two discs and I would come out ahead. Problem for us white-label buyers was inability to delineate who the band was, and particularly, who the female vocalist was. I only found out when I read it here eight days ago! The label credit was just "Good & Plenty." There's no way a purchaser could know where the group came from, or if they played at clubs or busking before getting a record printed. Where did they come from? Were there any good barns or swimming holes there? Ginny's voice has some very good qualities. The falsetto effect is quite unique. But one doesn't need to be a sound engineer to know, she was miked improperly. The lady was also not the sound-type listeners expected in those days. Nor could you get a handle on the physical type; I didn't guess the lady was black, but she could have been. I figured probably blonde, but was she 49 and more stocky, or very introverted and college-age? This was no Mary Travers, but the cover image above reminds me a tiny bit of Marianne Faithfull. There was nothing stupendous about Good & Plenty, but they were serviceable, and I must have spun "I Played My Part Well" 45 or 50 times over the years. Of course that's what you did when you only owned 17 45s and two LP records.